It is with great pleasure that we can announce the Appointment of John Lambert to the position of President of the CDHS with immediate effect. John was born in July 1930 and educated at St Dunstan’s college London. National Service saw him enter the Royal Navy as a Radio/radar electrician's mate serving on Destroyers. Following National Service John continued his education at S. E. London Technical College. As an Electronics Engineer he became Systems Project Manager for REDIFON (part of Redifusion). During a long and interesting career, he travelled the world advising and designing large radio stations for both governments and the military. John retired in 1995 and joined CDHS shortly afterwards where his hard work and enthusiasm led to the acquisition and installation of a number of major artefacts, including the Bofors Gun which proudly stands guard at the entrance to the museum. He served on the committee for a number of years and became Secretary. John's other interests include Amateur Radio, Sailing and Vintage Cars. He is the proud owner of an Austin 7. We thank him for his sterling efforts in the past as we welcome him to his new role in the Society. Brian A Jenkins, our President, unfortunately suffered a heart attack on 12th June 2014 whilst he was at home, and although urgent action was taken by the Ambulance Crew, they were unable to resuscitate him. He had been ill for a couple of months prior to this date and had been unable to visit the museum and take an active part in CDHS activities in the Historic Dockyard where his contribution to the foundation and growth of the Society will be long remembered. Brian entered the 'Yard as an engine fitter apprentice in 1953 and later became a "Recorder and Measurer" when injury made it difficult for him to continue as a "fitter". He was deeply involved in the running down and closure of the 'Yard along with the disposal of much of the 'no longer required' stock of material and equipment. After the closure he had several short-duration jobs before retirement age which allowed him to be involved with the CDHS. His Internet researches became more focused on the 'Yards history, leading to the discovery of the documents which showed that the date for the first Store House on the site was in 1509 and that the first warship launch was in 1525 (the vessel was "a pinnace"). Other work by Brian led to the creation of two "Research Papers" on "The Trafalgar Medal" and "Chatham's Figurehead Carvers". Brian's election to the committee, and ultimately to President, provided more opportunities for the demonstration of his leadership talents through his regular contacts with the Historic Dockyard Trust and dealings with many visitors to the 'Yard, including several 'notables' and being present at several social events. He visited Scotland, as a representative of CDHS, to see the building of the new HMS Queen Elizabeth aircraft carrier following the hand over of the "Elizabeth Bell" ( see item below). His contribution to the CDHS development will be long remembered and his presence sadly missed. The newly named ‘Steam, Steel and Submarines’ museum gallery was formally opened on Saturday 12th May 2012 by Admiral Mike Boyce KG, GCB, OBE, DL. This opening was a part of the "Ocelot 50 Celebrations" and culminated in a Beating the Retreat by the Band of the Royal Marines. This ship now supersedes the previous Sunne as Chatham's first built ship. The award was presented to Chatham Dockyard Historical Society by the Vice Lord Lieutenant of Kent, Mr Richard Oldfield at a ceremony in the Museum on 1st November 2012. The Deputy Lieutenant of Kent, The High Sheriff of Kent and the Mayor and Mayoress of Medway were also present, together with our new patron, Andrew Patience QC and representatives from Chatham Historic Dockyard Trust. CDHS has been awarded The Queens Award for Voluntary Service, otherwise known as ‘The MBE for volunteer groups’ - a prestigious award recognising their excellence in voluntary activities. Countess Mountbatten of Burma, our Patron of long-standing, indicated her wish to stand-down during 2012. She has supported CDHS and shown great interest in our activities over may years and feels it is time now to handover. After consideration of possible names for a new Patron, the Committee are delighted that His Honour Andrew Patience QC agreed to be the CDHS new Patron. His obvious energy and interest in the Society bodes well for the future. Thursday, 11th November 2010: The Ships Bell from HMS QUEEN ELIZABETH, a Dreadnought class Battleship commissioned in 1915 who served her country in both wars was handed over from Chatham Dockyard Historical Society to the Royal Navy. The Bell which had been on display in the Museum of the Royal Dockyard at Chatham will be proudly displayed in the Ward Room on board the new Air Craft Carrier, HMS QUEEN ELIZABETH. During National Warship week in 1942 the Baltic Exchange who participated in the national savings campaign adopted the HMS QUEEN ELIZABETH. When the ship was scrapped, the Exchange was presented with a plaque and the ships bell, on the condition it may be re-called to service at a later time. The bell was used on the floor of the exchange, where it was rung daily to indicate the end of trading. In 1992 the Baltic Exchange suffered a bomb attack and the bell was later put on display in the Museum of the Royal Dockyard in Chatham. 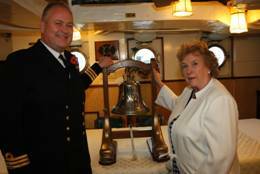 Shirley Goodhew, Chairman of the Chatham Dockyard Historical Society handed over the QUEEN ELIZABETH bell to Michael Robson, Director of the Baltic Exchange and on to the Royal Navy. Commander James Hawkins RN and Lieutenant Commander David Bingham RN received the bell on behalf of the Royal Navy. Michael Robson, Director at the Baltic Exchange said; “The Chairman, Board and Members of the Baltic Exchange are delighted to be able to hand back the Bell of the first HMS Queen Elizabeth to the Royal Navy in preparation for its installation on the new HMS QUEEN ELIZABETH. The Baltic has a long association with the Royal Navy and especially the HMS QUEEN ELIZABETH. The Bell was given to the Baltic in recognition of its adoption of the battleship and meeting some of the cost of her refit in the dark days of 1942/43. The Bell was used to start and end the sessions of fixing cargo vessels on the old Trading floor of the Exchange. Trading is now done on screens, but it is still the British and foreign flag vessels which are being traded and that belong to our membership. The seaborne trade makes up 95%of the World’s trade, so we more than most, understand the importance of the Royal Navy’s role in keeping the shipping lanes open at all times, especially with today’s growing pirate risk around the Globe. So it is our great pleasure to see the Bell going back to its spiritual home with the Senior Service and to renew our association the new HMS QUEEN ELIZABETH and her future crews”.